Tim often thought about how different things could have been. A few different choices at school, a few different words of wisdom from his father, and his entire life could have changed. He could have been a grunt, a marine on the ground. He could have spent his days putting down terrorist threats, fighting hand-to-mandible with the Vanduul on some out-of-the-way space station. He could be some tactician, playing a giant game of chess, sending people off to die as if they were characters in a game, pieces to be used and lost. Send the Vanguard to the front, sweep in with the Hornets and Gladiators to mop up, long-range support from the Retaliators. Pieces, not people. He could be one of them. One of the fighting men, the men on the ground and in the air, the men fighting and dying for the UEE. And sometimes he wished he was one. Sometimes he wished his life had gone just a little differently, that he hadn’t listened to his father. ‘I lost my leg and eye to the Vanduul, son,’ his father would say, bouncing him up and down on his knee when he was young. He sounded regretful then, Tim thought. He had been too young to realise at the time, but now, in retrospect… there was regret in his father’s voice. And with that, Tim’s decision was made, at least in part. His father’s dying wish, that he not lose his life to the Vanduul… he would uphold that wish. How could he not? But he could still help, could still fight in his own way; in his own way get payback for his father. For the life and limbs he lost. The Idris was coming into view now. 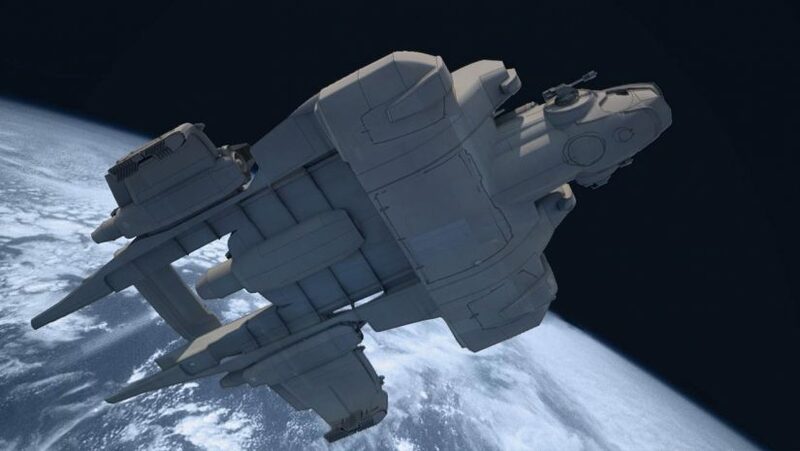 The UEE Hephaestus. She had a small wing flying around her, a 12-point sphere of safety around the big ship. ‘Hephaestus, this is Tim calling, callsign Hortons, ready to do a drop and fuel. Please confirm.’ This was a standard fuel run. No Vanduul in the area; no danger. Just get in, refuel the Idris and her squad, and get out. The fuel run itself took no time. Two hours later, the UEE squadron was refilled, back on their way to defend the sector from the Vanduul, and Tim was on his way back home. The UEE patrol would go on to do battle with the Vanduul, they would go on to be heroes, lauded for their work. Tim would work behind the scenes, would stay unnoticed. He would fulfill his father’s wish. He wouldn’t get killed by the Vanduul. But he could still help; he could still get his payback. It was two days back to home, and he thought of his father the entire way. The reports started coming in seconds after he walked through the door to his home, alerts vibrating through his mobiGlas. Tim flicked on the display, glanced briefly at the headings, then flicked the reports over to his wall-mounted lg.Watch, the large screen springing to life instantly. Sound from the report started coming in as he made his way to the kitchen. ‘Terrible news in the fight against the Vanduul today, as initial reports are surfacing that the UEE Hephaestus has gone down, destroyed in UEE space.’ The voice was scared – hurt. It seemed genuine. In the kitchen, Tim had no view of the screen. He would listen. Tim set a wok on the stove, got out a knife and some vegetables, and started cutting. ‘Initial reports have…have now been confirmed; there are no survivors from this terrible massacre.’ The news anchor was having trouble; she was on the verge of tears, and it was audible. Carrots, broccoli, kale, potatoes, leek, all chopped and thrown into the smoking wok. ‘The ships… the team were on a routine patrol, and they… they must have been ambushed, and…’ Tim could hear the anchor break. Some cricket tofu, chopped into small cubes, thrown in at the last minute. Douse the whole concoction with soy sauce. Throw in an instant noodle packet. ‘and he’s GONE! Jake, Jake, how…how could…’ Tim could hear scrambling from the audio, as a team ran to comfort the anchor. Jake must have been a lover, a husband. A son? He’d have been in the flight, he’d have been with the Hephaestus. Tim wondered idly if he’d talked to him, if he’d been one of the pilots he’d joked with as he refueled them. Food finished, Tim threw it into a bowl, grabbed some chopsticks, and made his way to the couch. The news anchor was gone; the video had started streaming images from the wrecks that had been found. The carnage was incredible, and devastating. Pull up to a gas giant in a Starfarer, loading up on fuel is a tricky task, but once it’s inside the ship’s tanks, the fuel is safe. Stable. Tim sometimes wished he could watch his work, could watch the fireworks as the UEE ships blew up from the inside. His father always said that the Vanduul had taken his eye and his leg; had said the Vanduul had taken his life from him. But Tim knew it was the UEE. It had been their fault, and they would pay. The stir-fry was delicious; slightly umami, crunchy, with firm noodles; mushy tofu with the crunch of the crickets inside, all topped with a satisfying jus of vengeance.